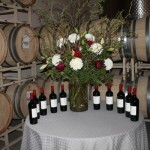 This years Fête de la Fleur also included a ten-year vertical tasting of Verite wineries La Joie. I was very excited that we were invited to attend the vertical tasting because La Joie is my favorite of Pierre’s three Verite Bordeaux style wines! I have had the privilege of enjoying many vintages of La Joie over the years, but never all ten in a row in one sitting! What a treat! We arrived slightly early and noticed that the lot had numerous impressive (and expensive) cars. Chris and I teased that we were happy that by luck we had been issued a brand new Mustang for our rental car and didn’t pull up in the typical mini van that we usually drive! We were immediately greeted by Monique who always makes us feel so welcome with her smiles and hugs. Soon thereafter, we said our hello’s with Pierre and several members of the Verite staff. 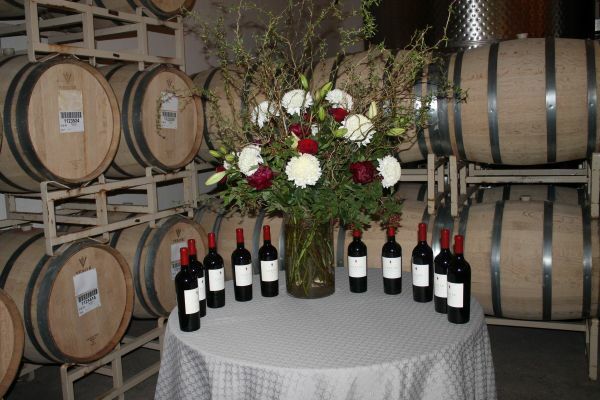 After our initial greetings, we were all invited into the beautifully decorated room where the vertical tasting would begin. The tasting began at 11am and concluded with a very nice light lunch under the oak tree, outside of the smaller tasting room. The weather was quite hot and we were happy to discover the tasting was to be held in the cellar. Chris and I dressed for hot weather and the tasting room was cool, but there were nice lap blankets throughout for those who wanted or needed them. Because the heat would not have made the tasting very enjoyable, I was pleased with the experience of tasting these great wines in the cool environment. 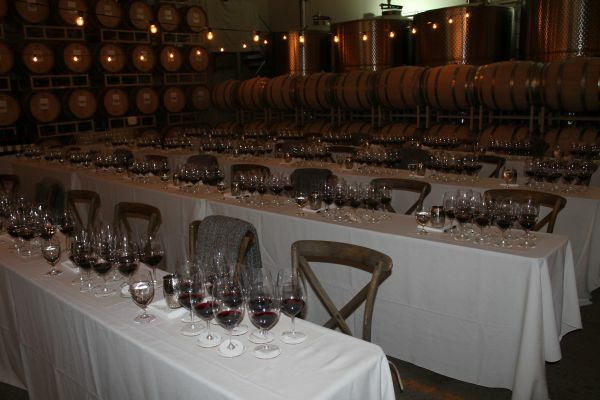 Within the tasting area the tables were lined up like a class room, with rows each seating eight people. Nearly all of the seats were occupied and sitting front and center – facing all of us, was Pierre. I of course, had to sit right up front! I told Pierre as a kid I preferred to sit in the front of the classroom and he joked he always sat in the back! An impressive Verite booklet and tasting notes created by the Kendall Jackson sales and marketing team was found on each one of our chairs. Pierre began by talking about Jess Jackson’s vision of a California Bordeaux style wines that would rival the great chateaus of Bordeaux France. He described and predicted that because of the “unique micro cru’s and soil of Sonoma hill sides, that this region would become one of the top three producers of the world.” I tend to agree. 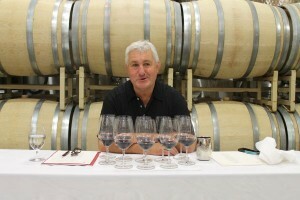 Pierre noted that the wines had been opened approximately two hours prior to our arrival and had only been poured fifteen meetings before the tasting was to begin. He also stated that they were being served chilled to between 60 and 61 degrees Fahrenheit and he indicated that he wanted to serve the wines to be sampled cool so that we could see their “real potential”. None of the wines were decanted prior to our tasting. It was time to start tasting! 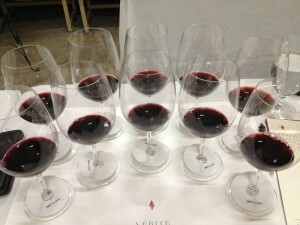 We were instructed to begin with the youngest vintage 2007 on our left and then to taste through the front row of glasses moving backwards in years through the vintages until we completed the front row of two glasses of five each row. We took notes as we proceeded through to the year 2002. We paused as Pierre opened up the room for discussion and reflected on his incite to each of the vintages we had tasted thus far. 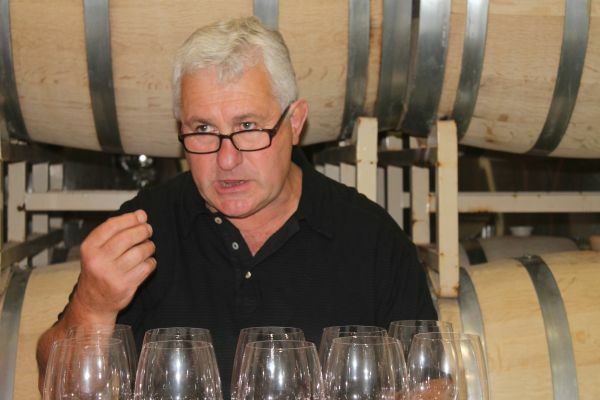 All of the wines Pierre produces are barrel aged in 100% French oak. He chooses his level of toasting per vintage and varietal and explained that he has six different toasts or what he calls “protocol”. 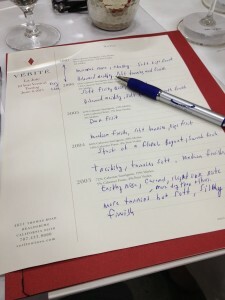 Here are my notes on the first ten vintages. 2007 – Four plus glasses. Harvest -> September 4th through September 7th. Mineral, “chalky” nose with soft ripe fruit. Balanced acidity, soft tannins with a smooth long finish. Cellar 20 to 30 years. Pierre said that this was “an exceptional year”. He said this one was a bit “too sweet for his pallet” and he noted black and red fruits! Harvest -> This year there was an early bloom and an “important year” according to Pierre. September 18th through October 14th. He said it was “an average, but good year that he would have picked a bit earlier” He also felt that this vintage was “Rich on the pallet” and had a “beautiful balance”. He suggests although it’s great now, we that have it in our cellars should “wait 15 to 20 years” to enjoy it. I noted a soft fruity nose. Ripe red fruit, caramel notes. Chris noticed toasted almond and I think it’s acidity was balanced with soft tannins and a smooth long finish. Pierre considers this the “Best” vintage of all three of his wineries (Sonoma – Verite, Bordeaux – Chateau Lassegue, Tuscany – Arcanum). Harvest -> September 22nd through October 6th. Dark fruit with an earthy nose and slight spice. Chris recalled a “Barn” nose, which isn’t unpleasant to her. She grew up with horses and something about this reminded her of that. It had a medium finish, soft tannins and red ripe fruit. Pierre suggested that it had “a balance of bouquet and dark fruit”. Cellar for 20 to 25 years. Harvest -> August 31st through September 17th. Pierre explained that they were “in a rush to beat the heat” while picking. Start of a floral bouquet. Noticeable acidity, tannins are soft but complex with a medium finish. Chris noted green pepper and green apple. It was her favorite nose and Pierre compared it to the 2001 as “it’s twin” but was “more closed” as it “doesn’t have the elegance yet”. He also recommends that you wait on this wine and try after 2018. Harvest -> September 17th through October 12th. Elegant earthy nose, caramel and slight oak notes. Noticeable tannins but soft and silky with a long finish. We noted red fruit with blueberry on the nose and cherry in the mouth. Pierre thought it had “elegance in the nose” and said that it’s “bouquet started about three years ago”. He also said that “it is nice to drink now”. Harvest -> September 10th through September 23rd. It was a 10 day bloom. Bouquet is opening and had a softer nose. We noted sweet caramel and soft cocoa. There was a hint of cherry and blackberry and I also thought it smelled a bit chalky. 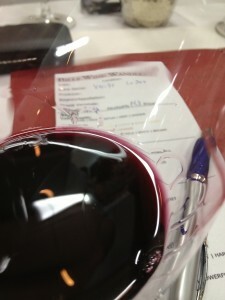 The tannins were felt in the mid palate and Pierre described it as a “cat tongue”, but it had a soft and silky finish. He also said it’s complexity was “beautiful and elegant”. You could cellar this for 10 years or more. This vintage closely followed the 2004 in both bloom and harvest. “Twins for harvest”. Harvest -> August 13th through September 17th. The bouquet is opening and Pierre says “it’s one of the nicest, but is still closed”. We noted sweet fruit, dark berry and bing cherry. It’s tannins were soft on the mid palate with a silky long finish. 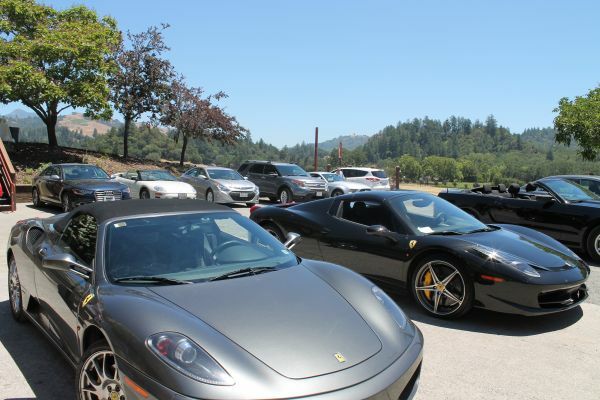 Bloom was long across all appellations in Sonoma County. Pierre explained that the “picking actually took an entire month; they simply picked where the grapes were ripe”. Harvest -> September 6th through October 6th. Like the later vintages I could see the wine evolving. 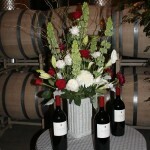 There was a nice bouquet developing and I noted a sweet nose with soft caramel and ripe red fruits. This vintage had soft tannins on the mid palate with a silky long finish. Pierre said this wine was “singing in the glass!” and “The time to drink it is now, though it was go another five or six years”. Harvest -> September 29th through October 9th. The first thing Chris said was “this is up Bill’s alley!” She knew this was my “perfect wine” and that I would love it. 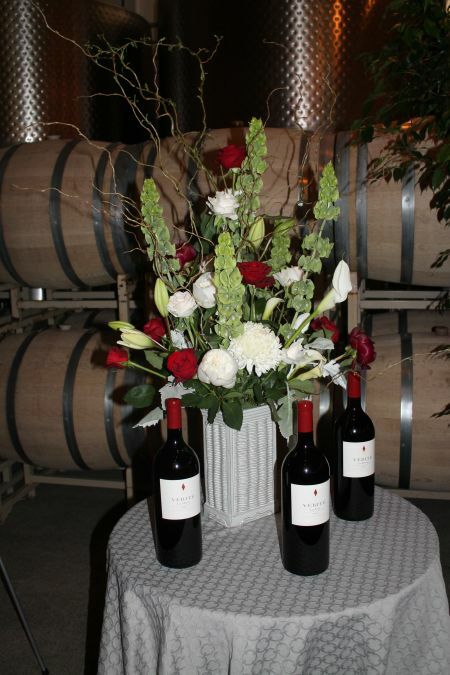 It had a wonderful bouquet that has developed with a nice rose, floral nose. As the tasting progressed I could also smell green pepper and Chris thought a bit of light apple. It had a super silky soft and long finish. The wine was showing some age, but Pierre said he would “decant this for two hours” before serving. I loved this wine! For me everything just worked. 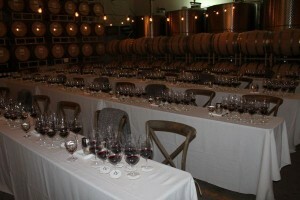 By the time we were tasting the last vintage, the volume in the room had increased significantly. Pierre said that the “Canapy was quite good and the bloom was long”; but it was a tough year. It was the first vintage and mother nature threw many curve balls. He explained that the harvest was very late and that if there was not enough acidity, it would have stopped the fermentation while the fruit loses its expression; he went to a second crop with a lot of acidity and the wine turned out a success! Earthy dirty nose and had an awesome “Creme Brulee” scent. I noted cherry and it had soft tannins with a smooth and silky finish. Lastly, we were surprised with a sample of the blended 2012 La Joie. I can’t say anything, but the 2012 was excellent! You could drink the wine right from the barrel; now! Many people including myself had to “revisit” the 2012 La Joie after lunch. 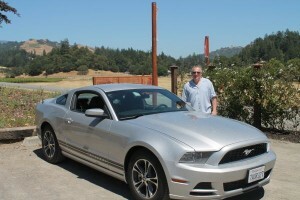 After the tasting we had a light lunch served under the beautiful oak tree by the tasting room. I am looking forward to the next vertical tasting and I hear the 2013 Vintage Verite on the Lake event will have another surprise? Can’t wait!